Product Style: Required Unframed Standard Frame Select Frame Deluxe Frame XL Canvas - 63" x 21" XL Aluminum - 63" x 21" XL Acrylic - 63" x 21"
This panorama spotlights the Detroit Lions hosting the Atlanta Falcons in the recently renovated Ford Field in downtown Detroit, Michigan. Ford Field opened in 2002 and is a distinctly Detroit venue with the stadium's Southside built around original brick that remained from the city's iconic Hudson's Warehouse. The Lions are one of the oldest teams in the NFL. Originating as the Portsmouth, Ohio Spartans in 1930, they were later purchased and moved to the Motor City in 1934. The Lions won the NFL Championship in 1952, 1953 and 1957. The Thanksgiving Day game is the greatest tradition in Detroit Lions football. Beginning in their very first season, the turkey day tradition continues to this day. Our oversized panoramic prints are all photo. There is no title, text, borders or logos, just the image. If you want to feel like you are actually in the stadium, these are the prints for you. 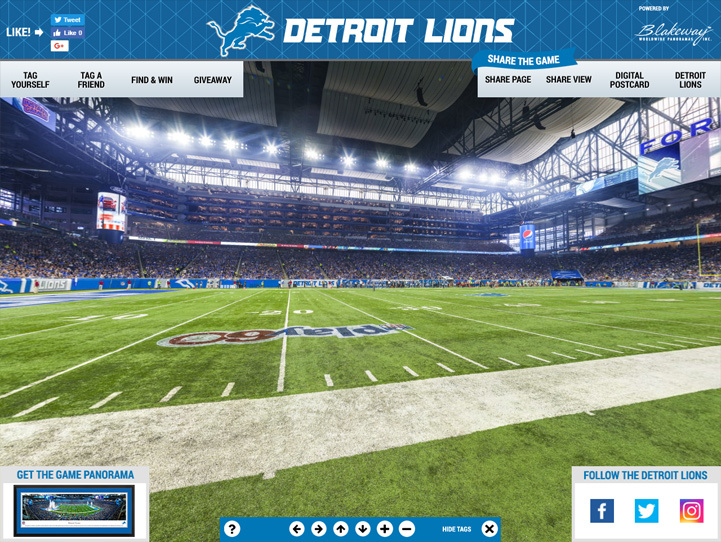 If you want to boldly proclaim your fandom and leave no doubt as to which team you support, these panoramas are for you. At 63" wide and 21" tall, these oversized panoramas cover some serious wall space and provide a striking focal point for your home, office or fan cave. Our oversized panoramas are available in three formats: canvas, aluminum and acrylic. All are shipped ready to hang and are suggested to be used as indoor decor only. No framing is required as each is equipped with a rear-mounted frame. Please note that all oversized panoramas are made-to-order and are NOT RETURNABLE. Please allow 3 business days for processing and production prior to shipping. Our museum quality canvases are crafted out of materials designed to last a lifetime. The photo is printed directly on to high-quality archival canvas with UV-resistant solvent ink and then stretched over a 1.5-inch thick, kiln dried pine wood frame. This is a Gallery Wrapped Canvas that is designed to be displayed without a frame. It looks finished from any angle as the image wraps around the edge of the frame and is stapled on back so no staples or unprinted edges can be seen. Care To clean, gently dust with a soft dry cloth. Care: To clean, gently dust with a soft dry cloth. Metal artwork is becoming exceptionally popular thanks to its durability and stunning detail. With metal prints, the photo is printed directly to .04" thick aluminum using archival quality, UV resistant, heat cured inks in a high-definition printing system. This aluminum artwork is then applied to a thin Zebra Board for stiffness and durability and attached to a black 1.25" thick rear-mounted frame that is flush with the edge of the metal print. Due to the glossy surface of the acrylic, prints look incredibly vibrant. The photo is printed directly to the back of the acrylic using archival quality inks in a high-definition printing system and then heat cured. Next a layer of opaque white ink is printed over the color to fill in the white surfaces and heat cured again to keep the colors vibrant. A Zebra backerboard is then mounted with a thin layer of clear photo adhesive and attached to a 1.25-inch black rear-mounted frame that is flush with the edge of the acrylic print. Care To clean, gently dust with a soft wet cloth or electronics surface cleaner. Care: To clean, gently dust with a soft wet cloth or electronics surface cleaner.